Five months ago, the fourth generation of the Rosenbauer PANTHER made its debut at the leading Interschutz fire industry fair and since then there has been lively demand for the new model. The fastest out of the blocks was the Changi Airport Group of Singapore, which already captured the very first new PANTHER 6×6 in June. The Changi Airport Group operates the hub of the same name, which has been voted the “World’s Best Airport” three times in a row and also has two Rosenbauer rescue staircases in its vehicle fleet. The new PANTHER for Singapore Changi Airport is equipped with an integrated N80 pump complete with a FIXMIX 2.0 foam proportioning system, a powder unit, an RM65 roof and an RM15 front monitor. The truck carries a payload 12,000 l of water, 1,500 l of foam and 250 kg of powder and is fitted with a 16.5m STINGER extinguishing arm. The first large contract has come from the Airports Authority of India (AAI). It has placed a fifty-vehicle order comprised entirely of the new PANTHER 6×6 with 10,000 l of water, 1,300 l of foam and 250 kg of powder on board. The extinguishing technology consists of an N80, a FIXMIX 2.0, a powder unit and an RM80 roof monitor. The pump and the monitor have been harmonized to perfection and both offer maximum output of 9,000 l/min. The monitor has a throw range of up to 100 m.
The Airports Authority of India operates 125 airports across the subcontinent including eleven major and 81 regional hubs. The fifty PANTHERs will be delivered by the end of 2016 and then distributed by the AII among 23 regional airports that will include Bhopal, Udaipur, Varanasi, Raipur, Bhubaneswar or Coimbatore. With the new vehicles, the Airports Authority has more than doubled its PANTHER fleet to over one hundred. Most recently, the AAI put six PANTHER-S trucks into operation and the first of the new PANTHERs was accepted at the end of October. Apart from the new PANTHER, its predecessor model continues to be in great demand. In 2016, trucks are to be supplied to the Lanzhou Zhongchuan and Chengdu Shuangliu airports in China, as well as other airports in South Korea, Kuwait, Mongolia and the Faroe Islands, to name but a few. Rosenbauer is also enjoying great success with the PANTHER in the USA. For example, during this year vehicles were supplied to airports that include the hubs in Houston, Miami, Dallas/Fort Worth and Fort Lauderdale and next year Los Angeles Airport is to receive its first PANTHER. 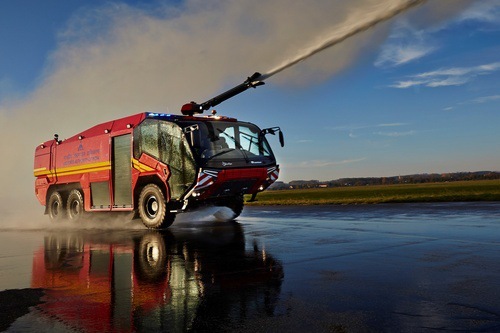 Since the launch of the first generation in 1991, over 1,400 PANTHERs have been sold, which means that Rosenbauer’s flagship ARFF is one of the most successful vehicles of its type of all time. Production takes place at the group’s Plant II in Leonding, Austria and the location in Wyoming, Minnesota. Serial production of the new PANTHER generation will commence at the beginning of the coming year. Rosenbauer is an internationally active corporate group that is a dependable partner of the firefighting community all over the world. The company develops and produces vehicles, firefighting systems, fire & safety equipment and telematic solutions for professional, industrial and volunteer fire services, as well as installations for industrial fire protection. In more than 100 countries, Rosenbauer is the largest fire equipment provider in the world with revenues of € 785 million and around 3,000 employees.